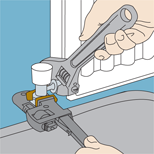 Summary: Learn how to fit a radiator, fix radiator brackets and install a new radiator. If you need to install a new radiator, it is easier to replace the old one with one exactly the same as you will only have to drain the radiator of water. However, the situation may be that the new radiator is slightly different in which case you must drain the entire central heating system. Firstly lay the radiator on the floor in front of the section of wall it is to be fixed onto. When laid on the floor the distance from the radiator to the wall should be the same as the distance between the floor and the valve on the supply pipe. Mark a vertical line on the wall to show the positioning of the bracket. Mark it in line with the bracket on the radiator laid on the floor. 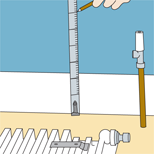 Now measure the distance between the skirting board and the bracket on the radiator and apply this measurement to the wall. The mark you make on the wall will dissect the first line you drew. Where the lines meet is where you need to drill holes. Insert wall plugs also. Now you can screw the first bracket to the wall. Repeat this process for the second bracket. Finally position the radiator onto the brackets. If it does not align with the supply pipe correctly, then you will need to unloosen the screws in the brackets and slide the brackets up or down to make the radiator fit. Tighten screws once the brackets are in the correct position. Mark a vertical line on the wall, using a pencil, in line with the position of the radiator's fixing brackets. 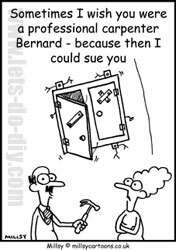 Firstly attach your new radiator to the wall brackets. These may need to be re-positioned to fit the radiator correctly. Clean the connectors if necessary and wrap PTFE tape around the thread of the tailpieces of the connector valves. Apply jointing compound in conjunction with the tape to make the seal as tight as possible. Now you can screw the tailpieces into the new radiator. Before screwing the bleed valve in to the top corner of the radiator, wrap PTFE tape around its base. Also fit a new plug at the other corner of the radiator if necessary. Now line up the radiator connectors and the supply pipe and screw the valves on. Use a wrench to hold the valves still while you tighten the nuts with a spanner. Make sure the joint is securely tightened, but do not over-tighten. Refill the radiator by opening the valves. Once re-filled, bleed the radiator by removing the air from it. This can be done by opening the bleed valve. Make sure the radiator is not leaking anywhere. Finally finish by opening the lockshield valve. Use a wrench to hold the valves still while you tighten the nuts with a spanner.